People are pretty smart, in general. If you put a group of people in an office building on a daily basis, they’ll soon figure out all its little quirks. Which rooms tend to run hot or cold, what combination of lights can be adjusted to make the room just a little brighter or dimmer, what time of day to close the shades to avoid an uncomfortable glare—these are all examples of smart humans adjusting their habits in order to accommodate ordinary buildings. But what happens when we flip this scenario? 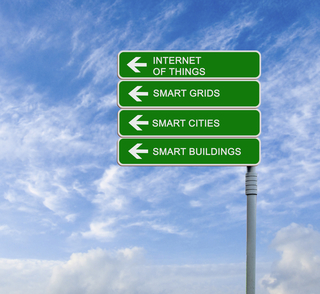 Smart buildings are the answer to this question. They are designed to adjust to the people who use them rather than the other way around. Thanks to an integrated building management system, smart buildings don’t just run on a schedule, they learn from their environs and respond to them. The more systems that are integrated and the more intelligently they respond, the “smarter” the building can be said to be. Efficiency and savings— Reducing the cost of utilities is often a major reason behind the development of smart buildings. Heating and cooling costs can be reduced when smart HVAC systems combine usage patterns with sensor data to predict the need for an adjustment. Energy-intensive appliances can wait to run outside of peak hours when electricity costs are lower. And of course, the environmental impact can be huge, especially when solar or wind energy are integrated into smart systems as well. Better feedback for easier maintenance— Smart buildings rely on a variety of sensors providing a constant stream of data back to the building management system in order to function. This same system of constant feedback also alerts the system quickly to problems. If a piece of equipment begins to malfunction, that information is shared right away. Rather than a vague message that “something isn’t working” or “Carla says her office has been freezing for the last two days,” smart buildings are able to quickly pinpoint the issue for swift and effective maintenance. Safer and more comfortable environment— Smart buildings enable people to spend their time in an environment that adjusts to their needs. This can look like the lighting over the desk of a person who is prone to migraines “knowing” that she prefers it to be dimmer, while the lighting over a factory floor never dips below a certain level of brightness for maximum visibility. It can look like equipment that starts up as soon as employees start arriving in the morning, rather than leaving people waiting around for their system to load before they can begin. It can look like elevators that will not take passengers during a fire, in order to a prevent a possible tragedy. Or it can look like getting a notification when the kitchen is down to its last cup of coffee. It all depends on what the priorities are. Built Smart or Made Smart? Constructing a smart building from the ground up is an option for some organizations, but what can be done about already existing buildings? Are smart retrofits possible? The answer is yes, but it can be tricky. A lot depends on the age of the building in question. For buildings with pneumatic HVAC, upgrading to a smart building management system can involve tearing up walls and ceilings, displacing employees and disrupting work. Add to that the asbestos that’s often lurking inside older buildings, and the process can become tricky as well as frustrating. Still, a retrofit can pay for itself in energy savings over the long run, even though it may take several years. Each building’s situation is unique. Just as the needs for building or retrofitting a smart building are different from constructing one that is more traditionally controlled, the security risks are different also. In a building with isolated systems, a hacker might be able to gain access to a single device or computer. In an integrated system, there is the potential for one device providing access to doors, elevators, and electricity. It’s important to have an IT security team that understands the particular needs of keeping a smart system secure. When dealing with computers, an update can quickly be issued as soon as a vulnerability has been discovered. Updating thousands of different sensors, in the same way, is not always possible, so the human side of cybersecurity becomes all the more important in a smart building. Strict limits on people who have access to key software are vital, as are robust, non-repeated passwords. And just as you would place security cameras in a hallway to watch for unauthorized individuals, it’s important to have systems in place to look for suspicious network activity. Sidewalk Labs, a subsidiary of Alphabet (Google’s parent company) is looking to go beyond the smart building and create a smart city—or at least a smart neighborhood in Toronto. It promises to combine a host of sensors and feedback from residents to create an urban environment that truly supports people in their day-to-day lives. Skeptics wonder if it will manage to serve even those who traditionally lack a voice in urban planning. The results remain to be seen. Comfy is concerned primarily with the human element of smart buildings. Rather than relying on sensors to decide on optimum temperatures, their system allows employees to control their own local environment through an app on their phone. In the future, they’d like to see if they can’t track employees’ preferences across spaces, which could be a huge boon for offices where hoteling is the norm. Verdigris is interested in energy usage. A small sensor attached to a circuit breaker box, along with an algorithm that can teach itself to identify sources of electrical uses, can allow building managers to analyze and change their own electricity usage, locate malfunctioning equipment, and more. And a consumer product is in the works, one that they’re hoping will be at a price point enticing to everyday homeowners.